The Cliffs of Moher stand over 200m above the Atlantic – some of the highest cliffs in Europe. Their scale and beauty can only be truly appreciated when viewed from sea level. A Cliff Cruise will take you on a voyage of discovery along this 8km shoreline – truly an experience not to be missed! Sailing schedule is tide and weather dependent. Typically sailing are 1:30pm and 5:30pm from Doolin pier. The Jack B also departs daily from Doolin for a trip to Inis Oirr which usually lasts about 4 hours, depending on the tide. This charming island is the closest to Doolin, with only a 25 minute crossing. It has a population of 300 approx. and an area of around 2 miles x 2 miles. Inis Oírr boasts one of Ireland’s most beautiful beaches with glistening crystal clear waters which are very safe to swim in. 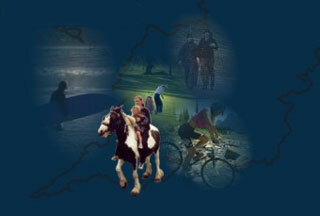 Bikes can be hired at the pier, trips by Pony and Trap, knitting lessons, a visit to the arts and cultural centre. Visitors to the cave are taken by friendly, informative guides through 1.3 km of passageway lit by a state of the art lighting system. Along the concrete paved route, stops are made to view animal remains, waterfalls and numerous cave formations. Time is also spent by our guides explaining to visitors how the forces of nature carved the cave out of the Burren limestone – a process which started over one million years ago. The visitor will cross bridges and descend steps to experience the magical and mysterious atmosphere of the underground Burren Region. Lahinch seaworld and Leisure Centre boasts a 25m indoor deck level heated swimming pool, Jacuzzi, sauna, steam room and Kiddies Pool. Bunratty Folk Park, recreates rural and urban life in 19th century Victorian Ireland. There is an extensive array of vernacular buildings; indicative of all of the social strata from the poorest one roomed dwelling to Bunratty House, a fine example of a Georgian residence for the gentry. Traditional jobs and crafts are also represented, milling, the forge, pottery, printing, baking, farming etc. Costumed characters that recreate the traditions and lifestyle of a bygone age animate the Folk Park. Take a boat tour to meet the Shannon Dolphins. Ireland's only resident group of bottlenose dolphins live in the Shannon Estuary. There are over 100 of these magnificent mammals and they can be observed, on most days, feeding, traveling or playing in the Estuary. The dolphins can be best viewed from the boats that undertake special tours and every encounter with the dolphins is different, determined by the dolphins themselves. In the interest of the dolphins, the boats operate to a code of standards. A special experience! Walking on the beach from, the battlement to the bridge and back, covers a distance of 4 Kms., are very popular every day tourist activities, as indeed are bathing, swimming and exercising the dog. (with strict controls) Because the sand on the beach is so clean it is a paradise for children. Since the inception of the European Blue Flag award by the European Parliament and FEEE, Lahinch Beach has been the recipient of this important environmental award. Trail riding and treking are available in nearby Ennistymon and several other places around Co. Clare. The Burren is an ideal region to explore on horseback. There are many options including lake and beach trails, and also the ancient Burren Highways or "Green Roads". Day-long, three-day and week-long trails are available. The wide-open spaces and hills are also ideal for cycling, with bike rental outlets in many towns. Clare offers some of the finest coastal scenery, inland charms, historic monuments & dramatic landscape contrasts found in the county. Taking time to cycle & walk this region will give you the greatest insight into just what it is that makes Ireland so unique. This has become a very popular activity in Clare in recent years and the area boasts some of the best diving on the West Coast of Ireland. The clean clear waters off the Atlantic coast are perfect snorkelling and scuba diving. A little further afield, there are shark, skate and tope to test the mettle of the deep sea enthusiast. The Clare coast line is famous for it's shore angling which can be done at Fanore, Doolin, Liscannor and Lahinch. Deep sea angling can also be arranged locally. Boats can be chartered from: Kilrush Marina, Liscannor Bay, Miltown Malbay, Quilty and from many places along the Shannon Estuary including Killaloe, Portumna Mountshannon. All of these beaches provide good shore angling for pollock, bass and mackerel.